Honorees of The 20th Annual Emerging Cinematographer Awards ceremony, celebrating 20 years launching careers, was held at the Directors Guild of America Theater, on September 26, 2016. The purpose of the ECAs is to nurture talent within the Guild and to give promising cinematographers the crucial exposure they need to succeed in the motion picture industry. The ECAs are open to any member of the Guild who is not already classified as a Director of Photography. 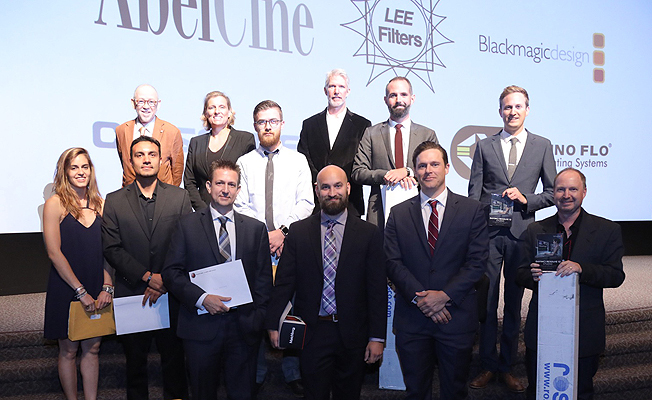 Dolby Laboratories, David Geffner and Rodrigo Prieto, ASC, are the recipients of the International Cinematographers Guild (ICG, IATSE Local 600) special 2016 Emerging Cinematographer Awards (ECA), announced Steven Poster, ASC, ICGs National President. The awards were presented Friday during the ECA opening event at the American Society of Cinematographers Clubhouse in Los Angeles. Dolby Laboratories, a leader in creating audio and video technologies that transform entertainment experiences in the cinema, at home and on the go, received the Canon Award for Advancement in Digital Technology, for their research into high dynamic range (HDR) standards and for developing the technology in professional displays and cinema projectors with their Dolby Vision solution. Dolby Vision combines two powerful capabilitieshigh dynamic range and wide color gamut resulting in astonishing images that, compared to standard pictures, deliver brighter highlights, more light-to-dark contrast, and colors never experienced on screen. From content creation to distribution and playback, Dolby Vision has support as an end-to-end solution from A-list Hollywood directors, cinematographers, executives at major studios and exhibitors as well as OTT service providers and TV manufacturers worldwide. Accepting on behalf of Dolby isRobert Carroll, Senior Director of Video Content Solutions at Dolby, who is responsible for the products and services used in production and post production to create Dolby Vision and Dolby Atmos content. The Technicolor William A. Fraker Cinematography Journalist of the Year Award was presented to David Geffner, Executive Editor of the award-winning ICG Magazine. Geffner began covering the film and television industry in the late 1990s as a freelance writer with a focus on independent film. Prior to that, Geffner worked in postproduction for Paramount Pictures and The Walt Disney Company, and in story creation for Walt Disney Animation. As a freelancer, Geffner covered a diverse range of subjects, including new media, green architecture, health care, eco-travel, sports, and business technology for outlets like Humanities Magazine, Westways, UCLA Magazine, The Los Angeles Business Journal, The Los Angeles Times, and The Surfer's Path. After becoming Executive Editor in 2008, Geffner has led ICG to more than a dozen Maggie Awards, and has supported the ICG brand as panel moderator at international trade shows like NAB and Cinegear. He lives in the San Fernando Valley with his wife and two children. Rodrigo Prieto, ASC, was bestowed with the Kodak Cinematography Mentor of the Year Award. Prieto, who was born in Mexico City, first came to the attention of Hollywood for his cinematography on Amores Perros for director Alejandro González Iñárritu. Soon he was making major films Stateside and winning awards for his unconventional use of the camera combined with strong moody lighting. Leading directors came calling, including Julie Taymor (Frida), Spike Lee (25th Hour), Oliver Stone, whom Prieto worked with on four films, Ang Lee (Brokeback Mountain and Lust, Caution), Cameron Crowe (We Bought a Zoo), Argo for Ben Affleck and two films for Martin Scorsese  The Wolf of Wall Street and Silence, set for a November 2016 release. He has been nominated for, or won awards from more than two dozen organizations, including the Motion Picture Academy, BAFTA, the American Society of Cinematographers, the Goya Awards, numerous critics organizations and major festivals including San Sebastian, Tribeca, Venice and Cameraimage. In announcing these awards, Poster said, Nurturing talent and giving promising cinematographers the crucial exposure they need to succeed in the Motion Picture industry lies at the heart of the International Cinematographers Guild Annual Emerging Cinematographer Awards. Similar ECA ceremonies will take place in New York on October 30, 2016, and Atlanta on November 13, 2016. For more information, visit www.ecawards.net. Media Partners: Camerimage, Cinec, Cinegear, Creative Handbook, Film & Digital Times, The Hollywood Reporter, ICG Magazine, IDA, Mill Valley Film Festival, NAB New York, Production Hub, SHOOT, SHOOT Publicity Wire, Sound & Picture, Variety, Variety411, The Wrap. The International Cinematographers Guild (IATSE Local 600) is a national union representing 7,800 members who work in film, television and commercials as Directors of Photography, Camera Operators, Visual Effects Supervisors, Still Photographers, Camera Assistants, Film Loaders, all members of camera crews and Publicists. ICGs ongoing activities include the Emerging Cinematographer Awards and the Publicists Awards Luncheon. The Guild also publishes the award-winning ICG Magazine.